Whenever a work of art is created, it is a product of the creativity of one artist or multiple artists that have been influenced by their surroundings which then reappear in some way in their work of art. In this context, ‘unoriginality’ is usually a term of negative value. Why is that? Well, we do not like to admit influence from the outside. We like to think our thoughts are our very own and we can only accept a new idea if it seemingly comes from ourselves or we have come to a deep understanding of that idea by ourselves – especially when an idea concerns us. But what, by contrast, is originality? Everything we make is derived from the world around us. The number of atoms in this universe never changes, they only arrange in different forms. And just as in the physical world, every idea and every thought we have is formed from things we have perceived with our senses at some point. Frankly, genuine originality does not exist. We can only be sure that art is not original because it springs from everything around us, so the one thing that definitely does exist is unoriginality. To deny this would not make much sense – still we do it: ‘You stole this story idea from that book and that movie!’, we tend to say. But if you think about it, ‘stealing’ is not the appropriate term. Everything is more or less stolen from somewhere – nothing can truly be called ‘yours’, as this would mean it is your property alone. It is only natural that we possess absolutely nothing that is completely our own and this makes any claim to originality and possession very unnatural. We have to accept that something which seems to be our own is not what it is assumed to be; once we create something (if ‘create’ is the right word – maybe rather ‘form something new’), it leaves our imaginary possession and enters the cycle in which all things inspire and influence each other, which is exactly the area it developed from. If this is true, life itself and every aspect of it have to be art, because life is the key condition of art; not only things we traditionally regard as art, such as music and paintings, inspire new art but also everything we see, hear, feel and experience or live. Only art can inspire art and so art is life passing through a person and becoming art (or life) again to pass through other people and so on. In this way, a work of art disconnects inevitably from its artist and the artist has no claim over it because he did not ‘create’ it truly. Yes, unoriginality is often denied, but now we know that it is elementary. Naturally, we should not turn away from our source of inspiration, the origin of our art, but accept and admit it. Influence is a wonderful thing! The greatest honour for an artist should be that something is ‘stolen’ from him because this indicates that his work of art was truly inspirational for someone. In an ideal and complete relation (nothing close to ‘stealing’), the person creating a new work of art out of someone else’s somehow connects the new piece with the old one, which I have tried to achieve in How To Read Ulysses. That your work of art – which can be anything – is not original, is obvious anyway and an undisputable fact, so the logical action with this knowledge would be to accept it, admit it, and maybe even make the work of art that inspired you profit from this inspiration by connecting both works with each other. Now this might seem hard. How do you connect works of art? There are multiple ways to establish or show a connection and it is easier than it seems; a simple way would be to name or show the primary work, which is already a change in perspective and approach because it shows that the artist is aware of its development and origin. What also helps is the fact that art has a semantic character. An example is fanfiction; a fan of a TV series, movie, book, or other works of art writes fiction that is set in the universe of the art they were inspired by. They might change minor or major plot points, characters or their relations and intentions to create a new storyline within that universe (it can also be a different universe with the same characters or storyline). Fanfiction takes a medium, for example film, and turns, or you could say translates it, into writing, and does not deny its connection to its origin because most of the time it depends on it. There are lots of books that get adapted from a movie or a play. They go through a translation from literary art to performing art. An adapted play or movie might be turned into a series of sketches and so the translation goes on into visual art. Just like this, a photograph might inspire poetry, or a television show architecture – everything is possible in theory. 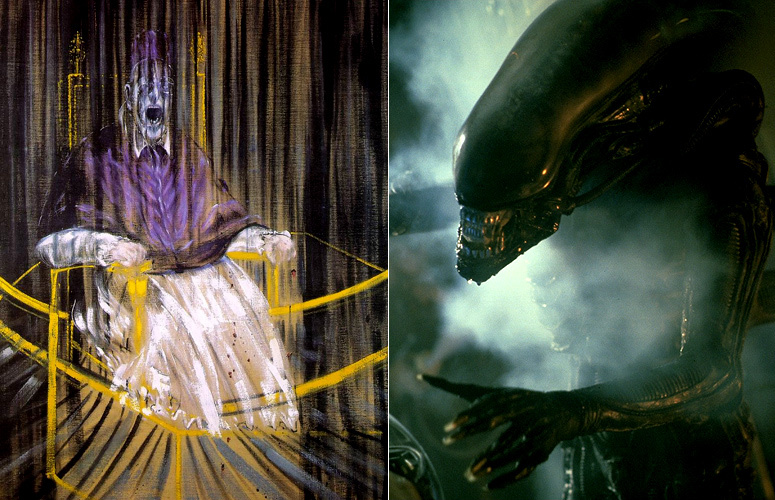 For example Study after Velázquez’s Portrait of Pope Innocent X, a painting by Francis Bacon inspired the modelling of the alien creatures in the movie Alien. Because of this semantic character, different kinds of art can also be put together into a new form of art. Comics present a hybrid of visual and literary arts. A different kind of translation or composition is used by Sigfried Lenz in his short story Einstein überquert die Elbe bei Hamburg; a situation of one place at a particular time is depicted and described as if it was a photograph that froze time at this moment, which stands in connection with Einstein being present and playing with the laws of time. This translation takes elements from the visual art that is photography and translates them into the medium of text. Finding and creating a connection in art might not always be as easy as that, though. Often you come up with an idea not knowing where it came from (then just assuming it’s from yourself). Or your inspiration comes from people, scenery, animals or feelings you got from something. In this case it is complicated to include life in a connection. But this does not matter. What is important here is to get away from the idea of originality and possession and start to connect art in theory in your thoughts. What you need to keep in mind is where your art originates from and what the circumstances were under which you produced it. Works of art not only constantly inspire new works of art, but art is also naturally approached from different perspectives and is translated into different arts. Thus, art becomes art again – just like life gives birth to life over and over again – and because it generates new art, translation is also another form of art. A work of art disconnects itself inevitably from the artist in the constant system of influence and becomes part of the world and the life that continues to inspire, so art belongs to everyone who wants it and everyone who can take it; this makes the perceiver of art the most important person in the system. It is the patient and willful audience taking time and putting effort into understanding, liking and appreciating a work of art. Art is in no way the property of the artist, but mostly that of the perceiver. It is most appropriate and sometimes even demanded to appreciate that role and become the artist yourself in the act of reflecting another work of art. Why not try it? Neele was listening to Pink Floyd’s The Endless River.